A couple of weeks ago a swimming friend (Julia) and I decided to head to waters new for our morning sea swimming session (to be closely followed by lunch). We went all the way around Torbay to Brixham (we don’t like to travel far down in these parts!) 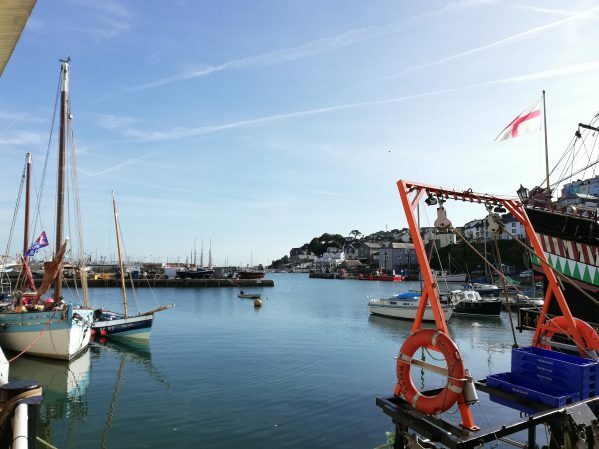 Brixham is at the southern end of Torbay and is well known for its fishing fleet, its Pirate Festival and its Brixham seals. We sat for a bit longer and watched the seals (we had worked out by this time that they were a big bull and a cow) start to slowly swim towards us. Watching seals swim is tricky because they do a lot of it underwater. I became a bit nervous at this point and decided that, as my choices were ‘swim back to the steps now when there might be a seal’ or ‘swim back to the steps later when I could see that there was one’, I would opt for a calm (outwardly) glide in as shallow water as I could manage. I made it back and we didn’t have an ‘in-water’ close encounter but both of my questions were answered, both seals could swim very fast and both made a point of enjoying the very area of shallow water in which we had just been swimming. They were beautiful to watch with their labrador-like faces and canoodling behaviour and were just a few feet from us. No photos I am afraid, seals are definitely camera shy. As a swimming group, we do have the occasional encounter with seals (and I don’t advocate trying to do so). I suspect we have far more encounters we never know about. They appear to be more curious than threatening and are certainly a pleasure to watch. If you are likely to find yourself sea swimming with seals, The Outdoor Swimming Society has some excellent advice from The Cornish Seal Group Research Trust.